That’s coming from a lengthy review on Redweek.com that goes on to talk about how understanding the hotel staff was during the situation. I don’t even know whether to believe the story or not. I do know this: Out of 265 reviews Google could have highlighted, that one seems like a terribly unfortunate (algorithmic) choice. While not nearly as tragic as the hotel’s snippet, my flower shop Place Page displays “I received the worst flower arrangement that I have ever seen” near the top. It’s from a review ‘gifted to us by Google’ about a different florist in another city. Not exactly what we want visitors to see when they land on the page, especially during Valentine’s Day week. Not only can we not control what G highlights, we can’t control the content they mistakenly dump on our pages. you would think they would be looking for words like drowned and flag the review. 2) These types of websites are turning the Internet into an information cesspool. You might love these types of websites because they provide you an online sounding board to vent, rant, whine and complain about a negative experience you had with a product, service, person or company. I can relate. Recently my wife had a bad experience with an employee of a local retailer which was part of a national jewelry store chain. It would have been cathartic for me to post negative reviews on a website, but I chose to take the high road and keep my complaints between me, the store and the corporate office. As a small business owner myself, making public posts would not contribute to the common economic good as it does not reflect well on all the good employees who work in this store. It would only serve a personal desire to impugn or embarrass this company online. Had I not worked in corporate America and received a regular pay check for many years, I probably wouldn’t give it a second thought. I would have jumped right into the fray and posted a negative comment on a complaint website. You hate these types of websites because they are wide open to abuse. Examples of abuse include: ex-employees posting false statements or competitors posting false statements hoping to steal your sales or business. Most people assume that some type of legal action is the best way to get a fraudulent posting removed. I don’t believe that. If you have a rich uncle or your father is a partner in a huge law firm you might try suing the website. But this is extremely expensive to do, and the final decision will not be a clear cut victory in your favor. We live in America. Negative speech, whether it be true or false, is protected in most states. This is a tradition that was exercised in newspapers and leaflets during the political campaigns going way back to George Washington, Benjamin Franklin and Abraham Lincoln. Today that negative speech is in the form of online postings which remain live and online indefinitely. This has led to the proliferation of reputation management companies. On the World Wide Web, no business wants to see a complaint website with a negative comment about them anywhere near their business website. Yikes! What do you do? First, the company will review and modify pages in your website to be sure it is search engine friendly. Second, they will create and/or post to Blogs, Directories, Websites, Forums to help facilitate the ‘pushing back’ of the negative website reference in specific search results. Today we have all these reputation companies, web developers, web writers, and SEO teams creating useless content and useless links to fight back against all these complaint websites. Even the complaint websites are getting in on this action and offering removal fees at up to $2400. There are even negative posts on competing complaint websites saying negative things about the other. I have found postings of people complaining that they paid to have the posting removed and once removed another appeared the next day. Sounds suspicious? a. Any complaint website that does not display the full name, email and phone of the person making the complaint should get pushed back in results. Or at least display an email that is tied to where they are a member. b. Any companies having an A+ rating with the BBB should algorithmically negate or receive a push back of any complaint websites targeting them. At this writing it is well worth mentioning that Yahoo and Bing do not rank these type of complaint websites as relevant in searches, not nearly as much as Google does. As a developer, I believe this speaks to inherent flaws in Google assigning so much value to back links. One of our clients recently had some reviews that not only weren’t flattering; they weren’t even for the right business. Argh! Google’s idea to scour reviews from other sites was great to me at first. Now things have gone horribly wrong. They just don’t add up! Somehow our ParentsConnect.com star rating of 5 is transferring over to Google as only a 1! 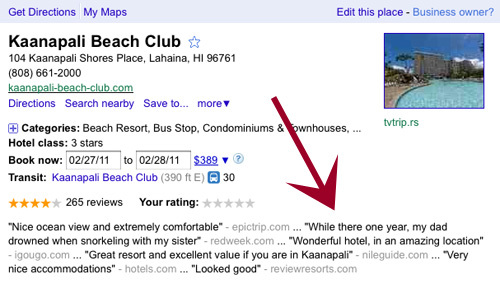 Now our Google Places star rating has plummeted to just under 2, and as a small biz, it is hitting us very hard. Moms pay attention to reviews. And they should….I know I do! I spend a lot on Google Adwords every month and it’s driving me crazy to think that another part of this company is screwing things up for me so badly. No reviews would be better than this rating. The fact that it is completely inaccurate and does not reflect our business only adds salt to the wound. I’ve been in the web biz for many years, and the question I used to get asked most frequently was “how can I get my website to rank” .. now the concern foremost on the minds of small biz owners is “how I can fix a negative review” .. it’s become a real and serious concern, especially for those very small operators who only have a few reviews, it only takes one disgruntled customer to ruin their online rep for a very long time. Wow. That would be hilarious if it weren’t so sad. Way to go Google! This is a problem that google has to resolve. These reviews can be very punishing for a business. Google carries so much weight with the general public.